On one fine summer day, Jill decides to run up the hill to fetch a pail of water to cool off with. Each day, it becomes hotter and hotter. On the first day, Jill only filled half of the pail. On the second day, she filled the whole pail. On the third, she filled a pail and a half, and so on. How many pails did Jill have to fill on the 10th day of summer? Graph and explain. 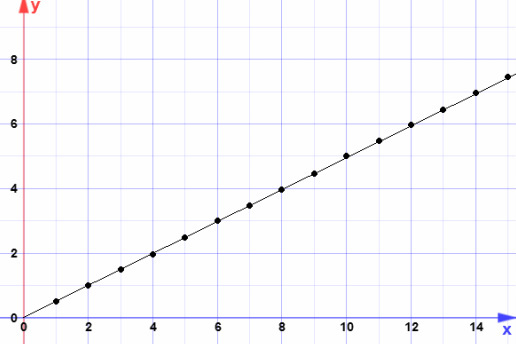 Since Jill did not fetch any water on the 0th day, we will have a y intercept of 0, the points (0,0), on our graph. The first day, she fetched half a pail, (1,.5), and so on. Can you tell what our function would be? It's f(x)=.5x, because each day, she adds .5 pails of water. We can graph this as it is on the left. The function is positive, it only goes up in value, not down. It is also linear, because we do not need to multiply by an exponent to find the answer. Since it is a function, it has a constant rate of change, in this case a constant rate of .5.